Hi, this is a good summary, thanks!. 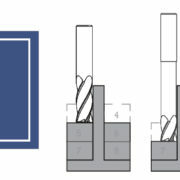 Would you consider adding to this article consideration for the practice of spot drilling using a much smaller drill bit? I was taught that spotting with a smaller drill bit works just as well since the outer diameter of the final size drill will not engage first, it would be the core that would center and engage first. 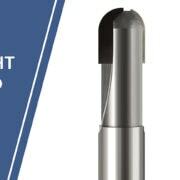 I’ve seen it recommended to spot with an angle smaller than the drill tip angle when using a H.S.S. drill. I’ve also seen the same recommendation for soft materials as aluminum vs steel. I’ve had the best results by always spotting with an angle greater than the drill angle, soft or hard materials, HSS or Carbide drills. I think HSS is more forgiving for sure vs carbide. I’ve used plain old center drills in stainless steel as they are cheap and hold up well then drilled with HSS drills. Works fine but I cannot attest to the accuracy as at that place we really never checked parts on a CMM. I dont feel this is correct. A drill tip magnified, you cant get a cutting edge. So if the tip touches first, for a split second it smears. I have spotted many 90 deg holes and never experienced “shock loading”. Thats why center drills are 60 deg. Lets the cutting edge of drill engage before the drill tip. Should you guys discontinue your 60 – 100 deg spot drills? Hi Mike! Thank you for your comment and reaching out to us with some inquisitive questions. 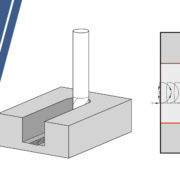 When drilling, the chisel angle – the very tip of the point angle, comes in contact with the work piece. Because you have the two cutting lips overlapping here, you form a chisel angle where actual cutting is not happening. Here, you want enough thrust for the drill to penetrate the material and then the chisel angle starts to extrude the material. The longer the chisel angle, the more durable the tip is but you will need more thrust in order to penetrate the material. Bringing this into the context of spotting, we can see why if you just barely touch the material you will get more rubbing and less cutting. We feel like you bring up a great tip here, no pun intended, that when spotting you want to take enough of an axial depth in order to go past the chisel angle and actually start cutting the chip. Next, using the term “shock loading” may not be the best description on what is happening when you contact somewhere on the point angle first. 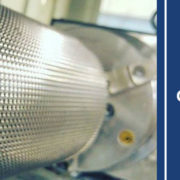 Shock loading typically comes from interrupted cuts so as long as the point angle is symmetrical and located perfectly, that should not be happening. What we want to get across here is that this is not the ideal way of spotting because of how the drill will now wear unevenly along the point angle and may lead to chipping. 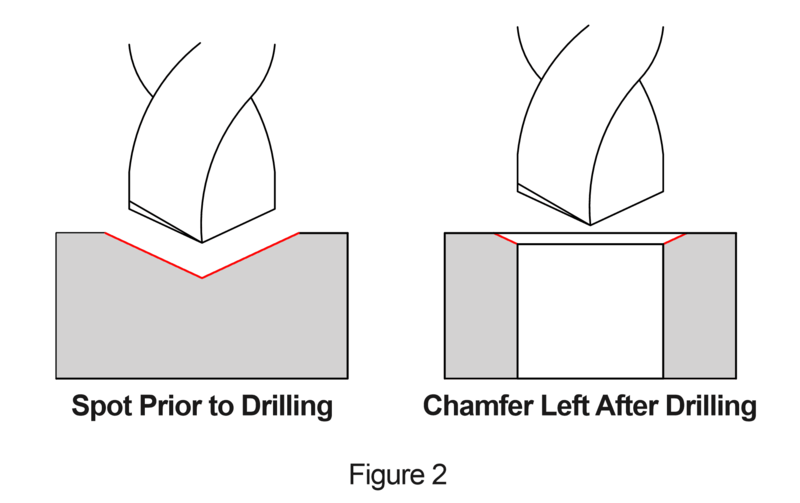 For example, if the drill always contacts half way up the point angle, you will start to see more wear there than what is happening close to the chisel angle. Historically, and with softer materials, this was less of a concern but with the advent of tougher and high temp alloys, we would recommend staying away from this. 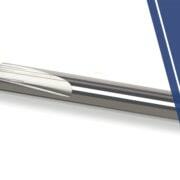 A flatter point angle on the spotting drill will help relive extreme stress on the lip of a drill in these materials. 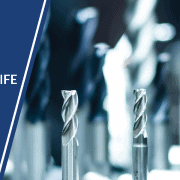 Ultimately, it is up to the machinist to weigh the pros and cons of any operation and we just want our readers to understand more on what is going on. Finally, as mentioned before, everyone has their way of doing things. We have heard that our customer use spotting drills as a combination tool and leave a chamfer at the top of the hole with them. This is why we offer such a large range of included angles to help with ideal spotting situations to help saving room in your tool carousel. 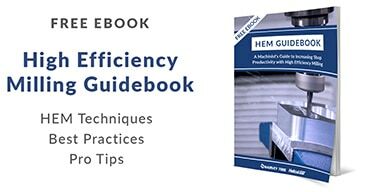 We hope you find this information useful and if you are having any more questions or any challenges with our line, from smearing to angle selection or anything between, please contact our experienced tech team at 800-645-5609 or email at harveytech@harveyperformance.com. If I had to drill into some concrete, I’d for sure make a spot drill. That way, I can be sure that my larger drill would be in the same place. However, I would have to go out and purchase all these tools as I don’t have any in my possession.